For 16 years plus tuition is available in the extended exploration of Shakespeare's Sonnets and Plays. This is a great way to achieve fuller understanding of the texts and access the language. TIMINGS: A residency type extended course for after school clubs, summer schools, community and higher education departments and amateur dramatic organisations can be arranged upon availability. Please phone to discuss options. Scared of Shakespeare? Can't cope with the Metre? Doing an Audition? A Recital performance with follow-up workshop, using a range of Shakespeare's work including Sonnets, Plays, Songs and Prose. Unravel what it means and how to perform it. Explore Characterisation and Verse Speaking techniques to work on Monologues, Duologues, Group Acting and communicating Poetry. TIMING: Available as HALF or FULL DAY. Suitable for KS3, Adult and INSET. 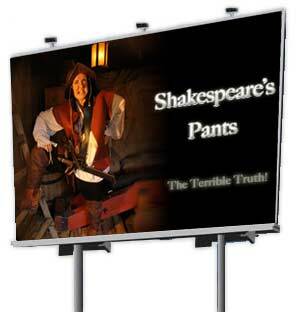 NEW “A Day in the Life of Theatre Bill”, otherwise known as SHAKESPEARE'S PANTS! Shakespeare's fictional ‘alternative' life is UNCOVERED in this zany exploration of story-making, textual performance and accent workshop. A humorous alternative introduction to Shakespeare, Poetry and Word Play. Suitable for all ages from 8 years up. Discover what Shakespeare really did for a living and why he had that very wobbly signature! 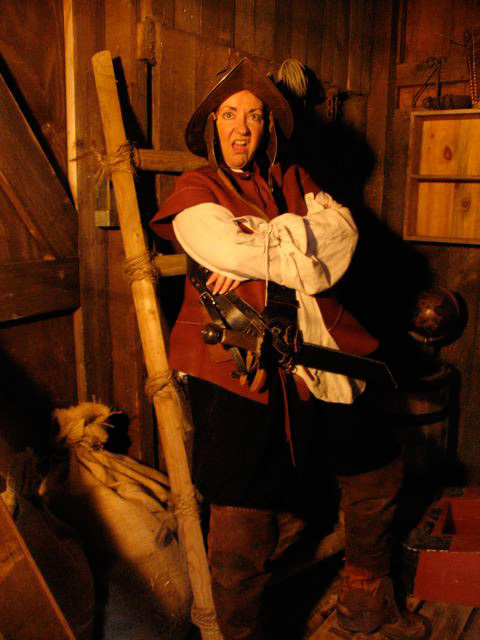 Uncover the ‘goings on' at the Globe, what a Cod Piece is and who discovered it. Meet his mates and de-mystify The Bard. Then learn how to speak in a Cockney and a West Country accent. WARNING: “Tall Tales” and fibbing take place in this monologue ! TIMINGS: Available as a short workshop (60 - 90 minutes) or with follow-up Creative Writing, Storytelling, or Group Recital performance.